As soon as you have established a date for your event, it is time to start looking for a caterer since in major metropolitan areas the better caterers are booked a year or more in advance. If you are planning to hold your event in a hotel or a facility where catering is provided, it may not be necessary to book a caterer since it is part of the facility package. Different caterers offer different amenities with their catering packages and they also package them differently. You need to find out exactly what is included - and what is not included. Listen carefully and take notes. How long has the caterer been in business? Caterers come and go. Make sure they do not go with your deposit. Most catering companies that do not make it end up folding within 12 to 18 months of starting business. Consider their track record before handing over a significant deposit. Has the caterer serviced the location where you are holding your event? A caterer who is familiar with the facility knows what is required for efficient service of your guests and knows the mechanics of the facility which means that there is less probability of mistakes, oversights or duplications of service. A caterer who is familiar with the facility can also advise you relative to other possible oversights or service duplications which will end up saving you unnecessary expense and headaches. Does the facility charge the caterer a "catering fee" to provide service at that location? Some facilities charge caterers a flat fee or percentage of sales fee which means that your cost of catering at that facility may end up being higher than at other locations - because the cost of the fee usually ends up being buried in your bill. If a catering fee is charged at that location you may be better off looking at another location where a fee isn't charged. Has the caterer provided service for a group of this size before?You may have a large number of people at your event and they will all need to be served in a very short period of time. Not all caterers have the experience or are equipped to service large groups. Specialized equipment is required to prepare, transport and maintain the proper temperature (and quality) of large quantities of food. How many events will the caterer be providing service for on a given date? Be sure that the caterer is not over-extending their abilities by trying to provide service to more clients than they are capable of. What is the ratio of servers to guests that the caterer will be providing? This is especially important when sit-down (table service) is required. What is the cost and what "exactly" is included (and not included) in the cost? You will want to get an itemization what is provided by the caterer and the costs associated with the catering package. 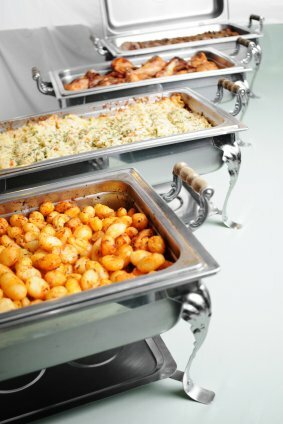 Find out what other costs are directly associated with the food catering that are not included in the catering fee. Does the caterer take care of items like table set up and tear down and placing the tablecloths/skirts on the tables? If the facility does not take care of table set up and tear down, someone will need to do it. Some caterers will handle the set up but not the teardown. Others will handle teardown and cleanup at an additional charge. What is the amount of tax and gratuity? Do the quoted prices include tax and gratuity or is it added to the food cost total? Some caterers include tax and gratuity in their per person charge while others add it to the total billing. Is gratuity based on the total food bill or is it based on the total bill? Some caterers use the food total as a base for the gratuity while others use the entire bill as the base. If you are obtaining rental items, i.e. linens, china, glassware, etc. from the caterer and they are basing gratuity on the total bill this could add significantly to your cost. How are leftovers handled? In many cases there will be a significant amount of food leftover at the end of service. Some caterers will package the leftovers for you while others will simply dispose of the leftovers. Tip: If refrigerated storage is not available at the facility, bring coolers with ice to store the leftovers. Food that has been in temperature conditions of higher than 40 degrees F or lower than 160 degrees F in the case of heated foods for 4 hours or more should NEVER be saved due to potential food related illnesses. How is the staff attired? Some have a uniform standard while others are somewhat lacking in a uniform appearance. Do they have recent references from events they have catered? References are a must. It is also a great idea to view photos of previous events so you can see what the caterer is capable of when it comes to presentation. Good food presentation is as equally important as the quality and taste of the food. Ask for sample menus and literature outlining what is included in their catering packages. After you have spoken to the 1st caterer on the list you should have a pretty good idea of what information is needed from you and what questions you need to ask the other caterers. Listen carefully and write down notes from the discussions with each caterer so you can refer to them later. If during your conversation with a caterer a question arises that was not asked of another wedding caterer, call that caterer back and ask them the question. It is only way you will get an accurate picture of who will be providing the most complete service at the best price. Once you have decided on a caterer and event facility and have selected the menu it is time to reserve the service date and contract the caterer. This should be in the form of an agreement that outlines specifically what you are getting, when you are getting it, and what you are paying for - including an itemization of all labor and equipment charges and the specific services that will be performed by the caterer. Be sure that the agreement specifically outlines times and guarantees service on your date and time since some caterers have canceled service of a smaller event at the last minute in order to service a larger event. Be sure you fully and carefully read the agreement before signing it. Double check to make sure that no services are duplicated by another service or the facility before signing the agreement since duplications will impact your total event cost.